Sonia Bary Shaw, 90 years old, died at Miles Memorial Hospital in Damariscotta, Maine, on the evening of April 6, 2019, after a long battle with chronic pulmonary obstructive disease. Sonia was born on December 18, 1928 in Philadelphia, the only child of George Alexander Bary and Mary Gorbof Bary, who came to this country from Russia following the Bolshevik revolution in 1917. As a child, Sonia accompanied her mother, a professional dog handler, on trips to Europe to buy dogs to show in America. Thus began her lifelong love of breeding and showing dogs, first dachshunds, then Afghan hounds, Springer Spaniels and Scottish deerhounds. Sonia grew up in coastal Connecticut, graduated from Hand Academy in Madison in 1947 and attended Larson Junior College (now Quinnipiac University) in Hamden. In 1952 she married Herman Baskin. They were divorced in 1959. She married Robert Howze Jones in 1960 and together they raised a family on Long Island, New York. They moved to the Albany, New York, area in 1981. After Robert died in 1984, she married Howard Shaw, a fellow dog enthusiast. He died in 1995. Sonia had an engaging and energetic personality coupled with a zest for life and an acerbic sense of humor. She made many friends through the various dog show organizations she participated in, such as the Troy (New York) Kennel Club. In 2006 she relocated to coastal Maine to be near her older son George. There she enjoyed volunteering for the Friends of the Waldoboro Library. 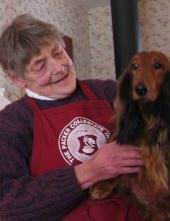 She will be sadly missed by her friends and family in Waldoboro. George and his partner, Paul Fuller, of Waldoboro, Maine, survive her, as does son Mark and his wife, Rebecca, of New Windsor, New York. Sonia’s sons want to thank their friends and neighbors, and the staff of Lincoln Health, for supporting Sonia in her last months. Please consider a donation to the Dachshund Rescue of North America in Sonia’s memory. Internment will take place in Coeymans Hollow, New York, at a time convenient to the family. Caption for photo: Sonia with her dachshund Vicki. To send flowers or a remembrance gift to the family of Sonia Bary Shaw, please visit our Tribute Store. "Email Address" would like to share the life celebration of Sonia Bary Shaw. Click on the "link" to go to share a favorite memory or leave a condolence message for the family.